Seriously, on a more earthly fashion, there are differences. this device seems to take it up a notch! How do I know about such a device? Knowledgeable women have shared such info with me. I return to the oncolologoist this after 1500, to see the result of the blood and bone scan. This may determine the poisons they inject me with. California Gov. Jerry Brown signed measures to end the last narrow allowances in the state for campus carry and open carry but rejected one to mandate increased security at gun stores. Brown, a Democrat, signed AB 7, AB 424 and AB 1525 over the weekend while returning SB 464 to lawmakers, describing the last measure, aimed at ramping up security measures at gun shops across the state, as an overreach. The bill’s sponsor, state Sen. Jerry Hill, D-San Mateo, argued the increase in security was needed following incidents where burglars used cars to smash into gun stores across the state. The measure would have required gun stores to keep their firearms in a secure facility with steel bars on windows, deadbolted doors or metal grates over entrances, and an alarm system protecting ventilation in addition to installing exterior features such as concrete bollards. I’m so glad I live in the Free State of Arizona! A recent court case in California could have long reaching implications for Second Amendment rights and the way firearms can be sold to the public. The case, Teixeira v. County of Alameda, has not gotten a lot of attention, but could drastically impact the ability of individuals to sell firearms in private party sales. As it stands, the 9th U.S. Circuit Court of Appeals decision is a victory for those who wish to limit gun and firearm sales. In the case, an individual wanted to open a full-service firearms shop; the intended location fell into a zone that required a conditional permit. In this location, a conditional permit is needed to open a gun shop near a school, daycare, residential area, liquor store or other firearms location. In short, the current law makes it very difficult to open a facility at all, since pretty much every location in the county is near one of the outlawed facilities or near a residential neighborhood. The business owner challenged the ordinance, but was struck down by the court. Both the original decision and the appeal ruled in favor of the county, restricting the shop owners second amendment rights. As the plaintiff and business owner pointed out, restricting their ability to open a shop at all also prevented local citizens from purchasing firearms, potentially impacting their Second Amendment rights as well. Should the plaintiff wish to appeal, the case could be heading to the U.S. Supreme Court, where justices would address whether the county’s ordinance and the court ruling were truly constitutional. The argument that prospective customers might not be able to buy firearms is not at the heart of the case; there are other gun shops nearby — the county could be infringing upon the owner’s Constitutional rights. California’s 9th Circuit is already well-known for supporting laws and rulings that limit the rights of gun owners. In recent years, the court has upheld restrictive concealed carry laws and with this recent case, restricted the rights of business owners as well. Will this be the case that requires the Supreme Court to weigh in and clarify what rights individuals have to sell firearms and establish businesses under the Second Amendment? As more and more locales seek to restrict rights, particularly in Democrat led areas, it may be time for the highest court in the nation to make rulings that clarify the protections the Constitution holds for law abiding citizens. They’ll just keep battering away at common-sense language until nothing means what it says. Much as the Communists do with rights. Gee, I wonder if there’s a connection somewhere? Well, today I get to pick up my ‘films (‘from my last MRI and PET scan) and deliver them to the surgical center miles away, wherein this coming Monday I get to have another MRI (using those as maps) to obtain yet another MRI and lymph node biopsy. The hope is the diversity of the samples will provide a better sample with which to produce a more precise chemotherapy cocktail with which to treat the lymphoma. Hopefully, this can be concocted and administered later this week, or early next week. While they are in there, they they will also be doing an angiogram – just because they found a tiny problem they want to check. Unfortunately my cellular phone took a dump, and I didn’t receive them until Wednesday night! So I called Thursday morning, early. At length, I was placed in a que, and told they would call me before 1300. If I didn’t hear from them, I was to call them. Subsequently, I wad placed in another que, and the would call me letting me know when they would call back. I was told 45 minutes. The said they would call after 9 minutes. They did eventually call, to advise me they were unable to take my insurance. I spent most of my chair waiting for a phone to ring, only to be told they were unable to assist me. My oncologist won’t return until Tuesday. His assistant was supposed to call me yesterday afternoon. It’s no big deal, just being used to develop the correct chemotherapy medicine for me. As previously recounted in these pages, I was recently hospitalized for two separate visits. The first time for kidney and blood ailments; the second for a further analysis of these ailments, resulting in a diagnosis of lymphoma. As it was the same hospital, the intake both times was similar. Entry through the ER, admittance, followed by a number of uncomfortable days and tests. During the first day, I was given what I was told was a standard questionnaire. Questions asked and answered. Questions like: Do I wish my Life would end? Do I sometimes with I’d go to sleep and not wake up? As I knew my personal items would be unsecured much of the time, I opted to go unarmed. During the second admittance, no such questionnaire was offered on day one. A genial nurse brought the questions to my room. Do I want to kill myself, yatta, yatta, yatta. I could answer these in my sleep. Then came the weapon and drug questions. No and No. I asked her for her warrant. She said she didn’t have any, just like the airport. I said exactly. She, of course, didn’t understand my point. After a long, angry standoff, she agreed to have me search my own clothes while she observed. (She obviously had no idea how to do a search.) I could have had two sidearms and kept them hidden from her! I told her about my previous questionnaire, and no subsequent search. She said those folks would get in serious trouble for not searching me. Apparently, there have been problems with guns (and drugs)! My search of my own clothes showed nothing. I oft wondered if she did find weaponry, what was her next move? So, there I was in bed, about 0558. I usually arise 0600-ish. And my insides strongly suggested we visit the bathroom , loo, necessary, the throne, the ‘fresher’. Fortunately, I was able to hit the raised toilet seat. Unfortunately, I slipped whilst trying to sit! And, in trying to re-position myself, again slipped! And found myself almost reclining, with not enough arm strength to maneuver. After about 10 minutes or so of wasting my time, (I asked Judy to get my left shoe, and put it on my left foot-obtaining possible traction. Not enough. I wrapped again on her door, to call the fire department, to pick me up. In about seven minutes, they arrived, picked me up, made certain I could stand and was ambulatory. And left! No medical check or questions! Did they ask if anything was injured or broken? Heart attack? They didn’t even check my pulse! I showered, dressed, checked in with Judy, and began my day. Late! The Large Magazine Debate: How Much is Too Much? There’s no real answer due to the fact that limiting one aspect of the 2nd Amendment can cause other aspects to be limited as well. Almost every mass shooter in history has used large magazines and semi-automatic weapons in their attacks on unsuspecting citizens. While many claim that reducing the number of rounds they can fire in a second or two would save lives, others can also claim that if teachers were allowed to be armed it wouldn’t matter how many rounds the shooters had available. Is the Size of the Magazine Really That Important? 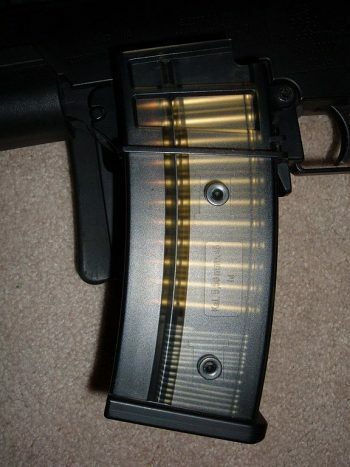 The main debate revolves limiting magazines that carry ten rounds or more. Legislators seem to miss the fact that it’s the person that pulls the trigger, not the weapon. If the person is intent on harming others, they will find a way to do it whether they have a ten round clip or a 100-round magazine. The debate will continue to go on as long as there are people in society who have different points of view. The answer may be in the opposite direction, however. Instead of limiting the rights of the people who can use weapons effectively, let’s keep the weapons and their accessories out of the hands of those who misuse them. While I don’t thing this was written by a knowledgeable firearm owner, it does make some points for conversation. This is not about GUN CONTROL.